If one of your goals for 2018 is to build your faith, getting into a Bible study is a great way to do that. This is a bible study is sponsored by Lifeway Women. It's completely free, except for the cost of the book, which is about $18.00. All of the teaching videos are included for free. The study lasts 7 weeks and kicks off on January 18. Click here to register. Beth Moore is starting a Galatians challenge in 2018. You can watch the video below to get more information. This FB group is where updates will be posted. Courtney Joseph of Women Living Well will be leading this study on her website. Every week you'll get discussion questions, a printable memory verse, a devotional, and a video - all for free! You can also buy this pretty journal, but it's not required. If you're interested in starting your own Good Morning Girls group, you can get the leaders manual here. This study kicks off January 15th - you can read all about it here. This study revolves around the book I Am Loved by Wendy Blight. The book walks you through 1 John and focuses on God's unconditional love. There will be blogs posts to read throughout the study and you can also join small groups on FB. The study starts on January 22nd. Click here for more information. There are several studies to choose from at She Reads Truth. The study of Matthew kicks off today and on January 29th, they'll start studying 1 & 2 Thessalonians. Find out more here. They also have great apps for ﻿women ﻿AND the men in your life. If you enjoy writing in pretty journals like I do, the Write the Word Journals might be perfect for your quiet time. If you're part of a church, I'm sure there are Bible studies going on there that you can get involved in. If you're not active in a church, then I encourage you to find a good Bible believing church and see what studies they have going on. ​I truly believe that building a relationship with Christ is the most important thing you can do. I hope that in the New Year, we can all reflect Jesus to our students in a gentle way. I recently put together a printable PDF with ideas of how to do that. Click here to access the download. 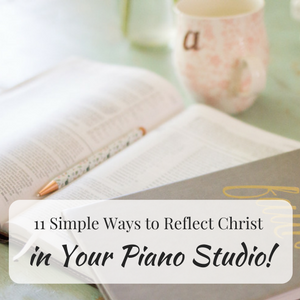 If you're looking for some gentle ways to reflect Jesus in your studio, you'll love this printable! Let's plant seeds and trust God to grow them. Confession: A couple weeks ago, I didn't feel like teaching piano. This particular morning started off great! There time to pray, read the Bible, jump on the treadmill, and have breakfast. But while making the bed, I somehow turned wrong and pulled a muscle in my back. It hurt SO bad! Within moments my excitement to teach piano was gone. Physically, I knew I’d still be able to teach, but my joy had gone right out the window! Clearly, I needed a reset. It happens to all of us at some point. Maybe there’s a physical reason we don’t feel like teaching. Perhaps we’re just not in the mood. Either way, the show must go on! Here are 10 quick ways to reset when you don’t feel like teaching. I hope these ideas help you the next time you're having a tough day! Beating yourself up for the way you feel will only make you feel worse. There are better ways to get through the day and it all starts with being kind to yourself. 2. Figure out the problem. ◆ Unprepared for lessons that day? ◆ Do you have a headache? ◆ Did you get into an argument with your child? Take the time to figure out what’s really bothering you! Now that you know the problem, figure out a solution. If you’re tired, can you take a nap? Are you stressed about dinner? Why not order pizza or just make sandwiches? This is not the time to hop on FB or Instagram and look at the highlights of everyone else’s life. We ALL have days when we don’t feel like teaching. Just focus on your situation and determine to reset! 5. Do something completely different at your lessons. ​Instead of teaching your typical lesson that day, do something FUN and out-of-the box. Your students will love the surprise and that alone will make you feel better! Maybe you could have a Game Day or Duet Day? What about spending the entire lesson working on composition? Everyone needs a little motivation! Give yourself something to look forward to once teaching is over. ​Maybe a hot bath or some reading time with a tasty latte. Text a friend and see if she can meet for dinner and/or dessert once your teaching day is done. In our Upbeat Planning Academy, Sara and I talk a lot about the importance of knowing your WHY. This is a critical element to keeping your attitude in check! Here’s an example: Let’s say you’re suffering from Piano Teacher Burnout and you crave a vacation, BUT you need the money. Instead of being frustrated, celebrate the fact that you’re supporting yourself and your family. “Needing money” is a wonderful “why” and it's nothing to be embarrassed about! 8. Get a new perspective. It’s easy to get into a rut when we teach 20, 30 or more students every week, but look at it from a new point of view by stepping into the shoes of your students. Each student only has ONE lesson each week and they deserve your best! They need you to be upbeat, energetic, helpful, and focused. Thinking about this always helps me to get my attitude in check. Another great idea is to ask yourself this question often: How do you want to be remembered? No one wants to be remembered as a grumpy, nagging piano teacher! ​Do some serious thinking and BE the person you want to be. Create moments that will bring wonderful memories! 9. Consider canceling some or ALL (yikes!) of your lessons. Some teachers may disagree, but I think it’s okay to cancel lessons on occasion. Yes - this is extreme and I don’t recommend it when you’re simply tired, but the truth is that some days we’re not up for teaching - and that’s okay. Maybe your dog died? Perhaps your mother was diagnosed with cancer? It could be that your child got bullied at school and the whole situation has you completely stressed out. While you don’t want to cancel lessons often, there are times when canceling might be the best thing. By giving yourself the necessary time to refocus and regroup, you’ll likely feel up to teaching again much sooner. 10. Pray and/or read the Bible. As many of you know, my faith is a big part of my life. When I’m having a tough day, reaching out to God always helps. Right now I’m reading through The Daily Walk Bible. I love it because the reading plan is so practical. ​Each day features an overview to help you understand the reading. Then every 7 days, you read a short summary to help you see the big picture, plus that allows time to “catch up” if you’ve fallen behind on reading. If you struggle finding time to get into God’s word, the pretty yellow Write the Word journal (pictured above) has helped me. ​Each day there’s a key verse to write out, along with space to journal, take notes, write a prayer - whatever! One of the things that I've done to simplify life is start online grocery shopping at Walmart. There's no charge for this service as long as you're purchasing at least $30 worth of groceries. It's amazing! I reserve the time I want to pick up my groceries, pull up, and they load them in the car. I'm saving time. I'm saving money. It's a HUGE win for me! If you've never tried it, you can click here to get $10 off your first online purchase. Do you need practical help setting your day up for success? 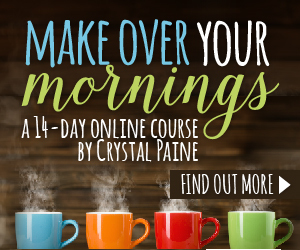 ​The Make Over Your Morning Course made a huge difference in my life a couple summers ago. Shortly after I finished that course, I was so motivated and encouraged that I created Upbeat Piano Teachers!